Great Impressions: The Echo Park and Great Impressions Stamps Hop! The Echo Park and Great Impressions Stamps Hop! 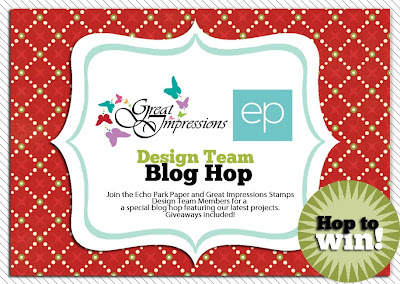 Welcome to the Echo Park Paper and Great Impressions Stamps 2012 October Blog Hop! so plenty of time to savor all the wonderful projects! all ready to soak in some holiday inspiration. to share with us how you were inspired! I completed the hop! so many awesome projects, i want to make several of them. Thank you for teaming up with Echo Park Paper. i am truly inspired by all the gorgeous projects! Love how versatile your stamps are and it goes perfectly with Echo Park paper. Thanks for such a fun hop! What a great hop - really gets me in the mood to start some holiday projects. That vanilla chai sounds yummy! Thanks for a fabulous hop! Great hop, loved all the inspirtation! I was very inspired by all the designs, I loved the penguins, and the snowman, and don't forget that fabulous icing stamping! Wow! What a talented group! This is my final hop stop and I have had such fun seeing all the great stamping and paper combos! GREAT STUFF!!! Thanks! Fantastic hop! I really love the cute deer. I am not much of a stamper, but your dancing reindeer have really tempted me to give it another shot! I was inspired to get back in my craft room and make some cards. The design team members are so talented. I'm glad they each shared a project or two to inspire me! This was such an inspiring hop!! I just loved all the fabulous stamps and the pair up perfectly with Echo Park products..
Great cards ! makes me want to skip making the Halloween and Thanksgiving ones and skip right to Christmas. Thanks for the chance to win ! Love the variety of projects! Super cute stamps, love the different ways they were used. Lots of great inspiration! Your stamps are awesome! I love all the designers projects!! Loved it. Some very cute stamps, beautiful paper and some great ideas. What a fun blog hop it was with many wonderful projects from so many talented ladies. Love the stamps that I saw a long the way. Thanks for sharing!! The blog hop was absolutely fantastic. Some really good ideas and great products to work with. Awesome hop and some wonderful ideas!! Great blog hop! Loved all the cute mice and deer especially. I wasn't thinking Christmas when I started the Hop but now my head is swirling with ideas. Thanks! Got so many good ideas for future projects. All of the ideas were great and I'll be incorporating them into my cardmaking. Love your stamps. Have some of them and want more. Thank you for the opportunity to hop along & see some wonderful creations. I love Great Impressions stamps, they are one of my go to stamps I reach for when creating. Thanks! I'm definitely inspired to do some traditionally colored Christmas projects right now -- never mind that it's October! Thanks for the blog hop! Some great ideas and different ways yo use the papers, stamps and stickers. Loved this hop. It's really got me in the Christmas mood and I've seen some great stamps that I want!!! A fantastic hop! Thanks for the fabulous eye candy!! great hop - loved all the stamps and paper! Great hop! I really enjoyed it. Thanks all! This has been a great hop-loved all the DT creations! What a fun hop this was! Really enjoyed seeing the stamps and how well they coordinate with the new EP Christmas papers. Wonderful blog hop - great way to end my Monday :-) Thanks! Fabulous blog hop--I enjoyed all the creations using your products. This was such a wonderful hop! Thank you so very very much! So many beautiful projects and lots of new ideas! Loved the candy box, and Tamaras treat box, and all of the cards! Great hop! Love the combination of Echo Park and Great Impressions! Lots of fun ideas! Great hop with amazing projects! What a splendid hop! Loved the cards and tags and Lowri's treats / treat boxes... so fun! What a great hop all the projects are awesome. So many great card ideas on the blog hog! I don't think I'm up to making my own cards this year, but I want to make some gift tags. Baby steps! Just finished the hop and wow, so many fun projects! I really love your cute whimsical stamps! Finished the hop and I must say the stamp sets used are just adorable. Totally love the whimsical designs. Awesome projects featured. Thanks for organizing. That was my first hop, but certainly not my last! What great projects, great ideas, and great products! Echo Park Papers and Great Imprssion Stamps have wonderful teams of creative artists! Thanks for the opportunity to win some great products! I finished the blog hop and thouroughly enjoyed everything that I saw. All the designers did a wonderful job and I have several things that I want to try and make. Thanks for putting all of this inspiration together. It has been a blast! Your have such a wonderful design team, such great projects. It was fun, with some fabulous cards and a great mini album! Thanks for the blog hop! love the mini album the most - the stamps are awesome on all projects! I love all the projects that people have created. Love the stamps!! Your stamps are so cute and thanks for the chance to win a set! was a wonderful blog hop, lots of great projects and inspirations. your stamps are great, they have personality. thanks for the chance to win. I've loved hopping along and seeing all of the awesome projects from these talented crafters. Great blog hop, so many ideas!!! thanks to everyone for all of their hard work and for sharing ideas. LOVE. What an amazing hop, so much inspiration from so many talented people, thanks! I just finished hopping. Thanks for the fun and inspiration. Just finished the hop. So glad I was introduced to you through this association w/EP. Saw several stamps I have to have! The projects were astounding! Thanks. Finally completed the blog hop in between work and family life! Definitely am inspired and itching to get stamping! Thanks for a wonderful hop! What a fantastic hop! Love all the different styles and projects! I am eager to get my hands on the paper! this blog hop had some great projects, I of course want to lift. I became a follower of quite a few new blogs. Thank you for adding to my crafting hysteria! Thank you so much for your ideas - love the robot card!!! This was such a collection from topnotch talented women. Each blog stop had me anxious to jump to the next one. You all have inspired so many of us with such a variety of superb ideas & projects! Really great hop, got me inspired to start thinking about holiday cards! Thanks for the chance to win! I enjoyed the hop. I was inspired with so many wonderful designers and their projects. Thanks. Loved this hop. Thank you for the inspiring work from all the ladies that joined in. There was so much amazing inspiration all in the one blog hop.. Fantastic blog hop! I've enjoyed the talented women and their projects! Thanks! Enjoyed the blog hop! It was fun to see all of the projects. Some great inspiration! Pumpkin Envie - Got Your's? Blessings Abound during Release Week! Woo Hoo! Release Week Continues! Yeah! Release Week is Here!